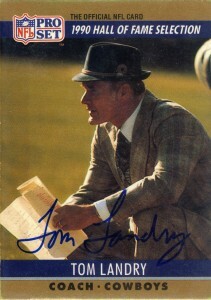 Tom Landry was a part owner of the San Antonio Riders back in 1992, and Bobcat Stadium in San Marcos did not have box seats, rather Landry and Larry Benson (the primary owner and brother of Tom Benson, Saints) had seats underneath the top deck in the shade at the back of the bottom row. I snuck in behind them during halftime and Landry had no problem giving me an autograph. He and I concurred that the team was much better in 1992 and was in store for much better things ‘in the years to come’. Tom Landry was a Texan through and through, born in Mission,Tx, going to college at Houston and Texas, and then being coach of the Cowboys for 29 years and his stoic presence on the sidelines and signature hat were a hallmark of the team. Landry after fighting in World War II, was drafted by the old New York Yankees of the AAFC in 1949, and then played for the New York Giants from 1950-1955, marking All Pro honors in 1954 as a CB, P/ KR. Amazingly he would also be defensive coordinator of the team in 1954 and 1955 before moving on permanently to coaching thereafter. Landry was considered an amazing innovator, creating both the 4-3 defense and the ‘flex’ alignment and then reintroduced the man in motion and shotgun formations among others. Tom Landry has a particularly large tree of apostles including Mackovic, Stallings, Ditka, Reeves,and Berry who all spent time learning under his instruction. Landry would guide the Cowboys to 20 winning seasons, 2 SuperBowl victories, 5 NFC Championships and win NFL coach of the year twice. After football Landry enjoyed a private life for the next 11 years before he passed away in 2000 (age 75) after being elected into the NFL Hall of Fame in 1990.